This budget hotel is a perfect choice if you would like to stay in clean rooms with good air conditioning unit and stunning river views while getting complete value for your money. There is also a nice open air lounge to sit out and enjoy a drink. 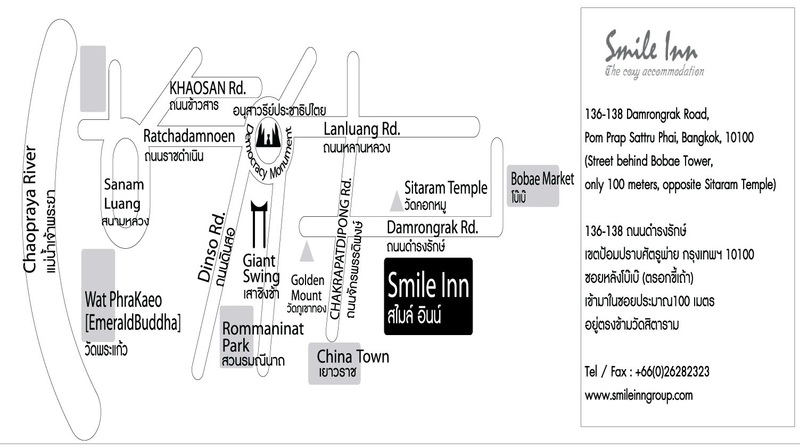 Smile Inn is a 2-star property in Bangkok, Thailand. 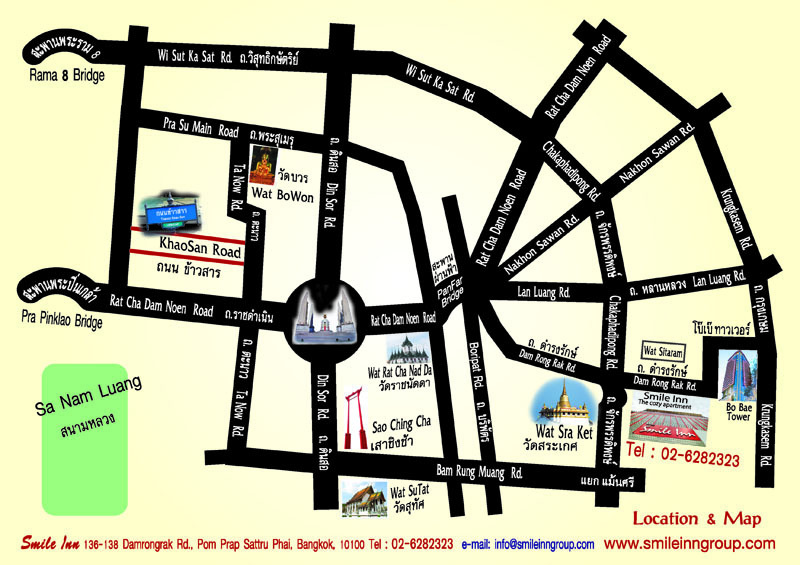 The hotel is situated near Saen Saeb Canal and opposite Wat Sitaram Temple making it ideal travelers. The hotel offers a comfortable shelter to couples and family travelers. Offering a quiet and cosy experience to guests, the property provides air-conditioned rooms along with complimentary Wi-Fi to all its visitors. The hotel also offers laundry services with additional charges. It also boasts of its spacious rooms with colorful interiors, attractive designs and modern-day amenities. It is just a 5-minute walk from Bo Bae Tower shopping centre and a 10-minute drive from the historical Giant Swing. With easy access to nearby tourist attractions and public transport terminals, the hotel is the right choice to explore Bangkok. 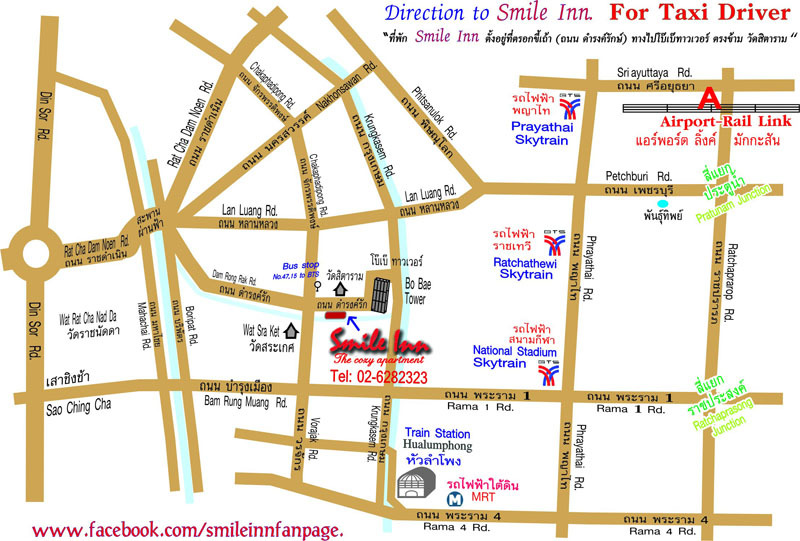 Smile Inn is 20 km from Don Mueang International Airport and 27 km from Suvarnabhumi International Airport. With friendly staff members, the 2-star property features rooms with colorful interiors. Also, the rooms at Smile Inn are fitted with contemporary amenities as per the needs of guests. In addition, the rooms are essentially designed keeping in mind the needs of all kinds of guests. It offers rooms under various categories, including Budget Single Room, Standard Double Room, Economy Single Room, and Standard Single Room. All the rooms are equipped with satellite TV sets, refrigerators, wardrobes, and free Wi-Fi connectivity. Further, the attached bathrooms are equipped with necessary bath amenities. 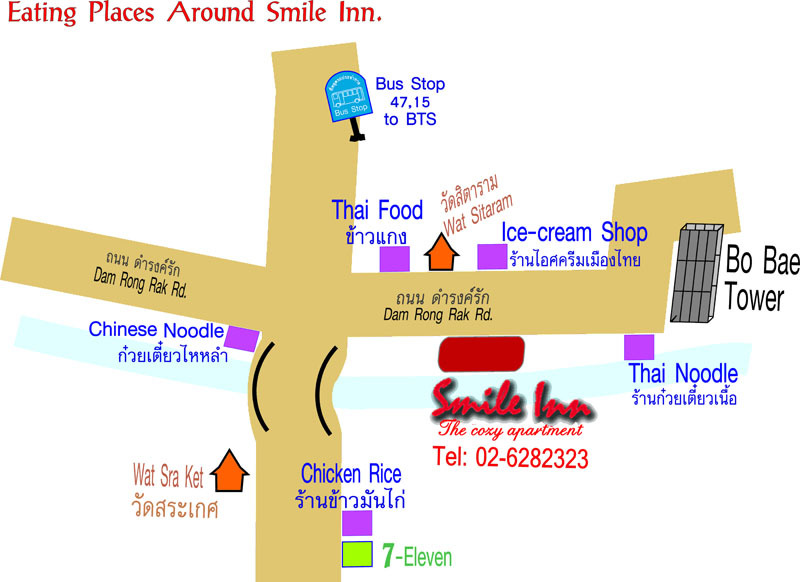 Smile Inn Bangkok features restaurants and bars within the hotel premises for the convenience of the guests. All the hotel rooms are well fitted with latest amenities and complimentary Wi-Fi. It also offers room, laundry, housekeeping and concierge services. The hotel maintains a tour desk and library. Further, guests are provided with opportunities for tickets to local attractions or local cultural programs at additional charges. The hotel also provide books, DVDs, and music to keep children busy. Guests can also go to on-site gift shop to buy souvenirs and gifts for their loved ones. Smile Inn Bangkok has a shared kitchen where guests can enjoy home-like meals. It maintains a no smoking policy throughout its premises. Further, guests can dine and enjoy their meals at nearby restaurants and bars. Getting a taste of authentic Thai dishes is a must for traveler. Guests who want to try true Thai cuisine can visit nearby restaurants including Thai Fried Tofu Khun Kai, Loong Pha Phad Thai and Jae Hong Restaurant. Smile Inn is situated nearby the popular tourist attractions. It has spacious rooms that feature colorful interiors. Besides, each of the rooms at the hotel are decorated elegantly and equipped with a range of modern amenities. 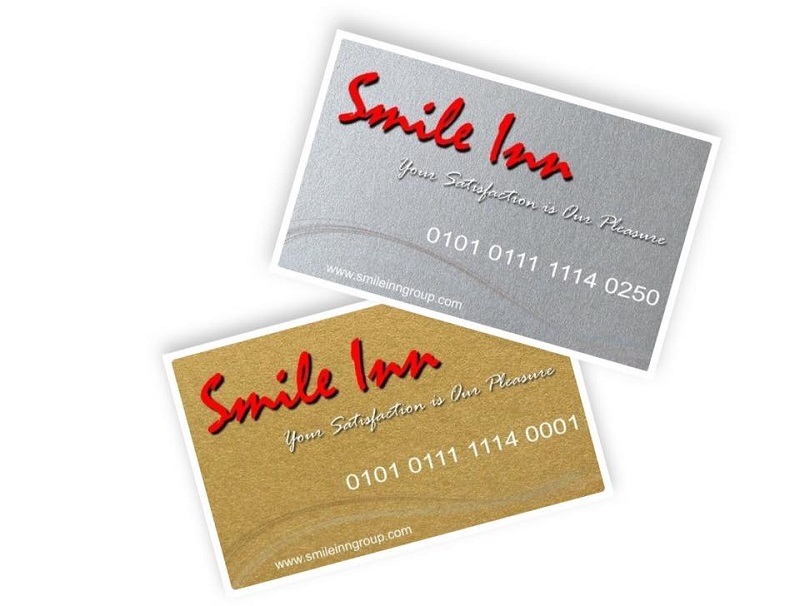 Not just this, Smile Inn provides comfort and sophistication like no other when it comes to looking after their guests. 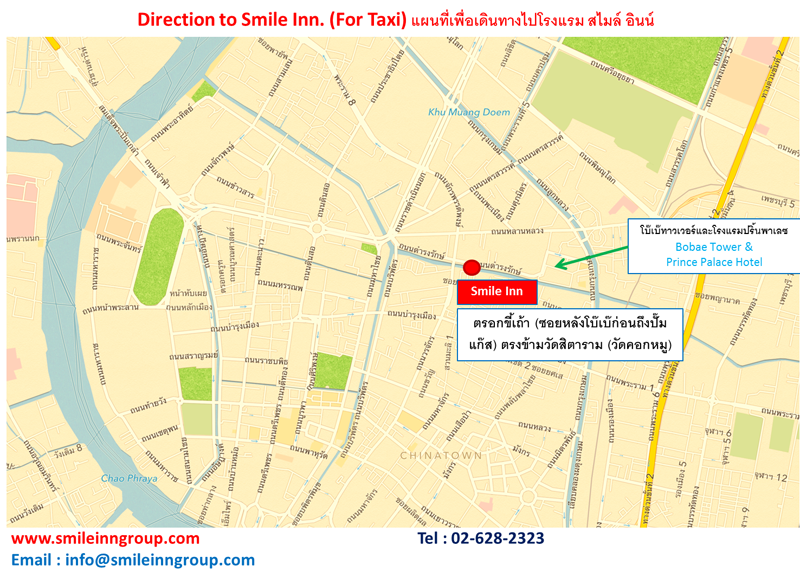 Smile Inn is located around 20 km from Don Mueang International Airport. Does the hotel provide ticket services? Yes, the hotel provides tickets to local attractions or shows at additional charges. What are the activities provided by the hotel? The hotel can arrange tours or classes about local culture with additional charges. And, guests can also use the hotels library. Yes, there are gift shops within the hotel premises. What guests avail private check-in/check-out? Yes, guests can avail private check-in/check-out at their convenience. Smile Inn is a perfect place for guests traveling on a limited budget as it is rated for the best value for money in Bangkok. Here, experience the cosy environment and soothing ambience the hotel has to offer along with spacious rooms with colorful interiors. The hotel is also known for offering warm hospitality with friendly staff. One can explore the temples and famous destinations nearby as it offers ease of access to various tourist destinations. Guests can get a taste of authentic local cuisine from restaurants nearby. The shared kitchen at the property is a treat to all the guests who love to cook Smile Inn ensures that its guests are well taken care of and they develop memories for the lifetime during their stay.